Each of the train lines featured on this incredible 17-day Appalachian Rail tour of the region’s finest, lesser-known heritage railways has its own story to tell. After a day in New York that includes a circular cruise of Manhattan Island and free time to explore, hold on to your hat as the railway highlights just keep on coming. Visit three renowned railroad museums and six historic railways (three steam), including the oldest preserved railroad in the USA (the Strasburg Railway, which travels through Amish country), ride the ‘Frostburg Flyer’ heritage diesel train on the Western Maryland Railroad, join the Cass Scenic Railroad behind an original Shay steam logging locomotive, take an eight-hour return journey on the Salamander Train through mountain wilderness country (home to black bears and eagles), and more. Departing 22 June 2019, this 17-day holiday costs from £4,395 pp*. Experience steam in all its forms against the stunning backdrop of the Lake District, recently declared a UNESCO World Heritage Site. Miniature railways, traction engines and standard gauge locomotives all feature, as does a tour of Lake Windermere on the National Trust Steam Gondola, a morning at the Threlkeld Quarry & Mining Museum Steam Gala, and much more. Departing 26 July 2019, this eight-day holiday costs from £1,150 pp*. Explore the narrow gauge lines from the Bohemian Czech town of Jindrichuv Hradec to Nova Bystrice and Obratan on Ffestiniog Travel’s first escorted tour of this region. Rail enthusiasts will enjoy visits to the two Austrian lines nearby, from Gmünd to Gross Gerungs and Litchau, while the itinerary also spends time in Germany, taking the scenic route along the River Rhine, a paddle steamer cruise on the River Elbe and visiting narrow gauge lines in the Dresden area. Departing 6 June 2019, this 14-day holiday costs from £1,960 pp*. As the UK’s leading specialist operator to Romania, Ffestiniog Travel creates itineraries that show its clients the very best of this fascinating country which, whilst still operating city trams from a bygone era - using vehicles from the old Communist bloc or of western German origin - is modernising rapidly. This tour takes in five transport networks still using vintage equipment and includes ample free time to explore independently. Departing 14 June 2019, this 12-day holiday costs from £2,295 pp*. Rail journeys on the spectacular Kangra Valley Railway and ever-popular Kalka Shimla Railway (part of which is by private steam charter) feature on this new tour to India, which also weaves in unforgettable wildlife-spotting during three safaris in Ranthambore National Park and a two-night stay in the Pink City of Jaipur. Tick off Amristar, Shimla, Delhi, too, as well as sightseeing highlights that include the world-famous Taj Mahal and Amber Fort. Departing 28 October 2019, This 19-day holiday costs from £4,795 pp*. Joining Ffestiniog Travel’s collection of Small & Traditional tours (each with an emphasis on appreciating the true nature, history and culture of a country), this itinerary visits both the stunning Dalmatian Coast for which Montenegro is renowned and the equally beautiful, but far less well-known, mountains of the remote north. Rail highlights include a ride on the breath-taking route from Bar to Belgrade, whilst visits to Tara Canyon, Durmitor (Montenegro’s highest mountain) and the pretty lakeside village of Virpazar are among the other treats on offer. Departing 4 June 2019, this 12-day holiday costs from £1,925 pp*. Sample the delights of Prague, as well as the locally crafted beer for which it is renowned, on an Easy Rail Holiday (one destination, fully escorted and price friendly) that also includes a comprehensive tour of the city, a visit to Prague’s Museum of Public Transport, a private tram ride, a river cruise and beer tasting… plus plenty of free time to check out the neighbouring spa town of Karlovy Vary or the South Bohemia city of Český Krumlov, with its 13th century castle. Departing 15 May 2019, this seven-day holiday costs from £1,660 pp*. As well as details of its 38 escorted small group tours across the UK, Europe and worldwide for 2019, Ffestiniog Travel’s new brochure also features a selection of sample itineraries which can be tailor made for single travellers, couples, families and groups. Short-haul options include a Scottish Circular Rail Holiday (nine days from £1,600 pp*), A Taste of Italy – Padova, Bologna & Stresa (14 days from £1,830 pp*) and The Baltics by Train (10 days from £1,575 pp*), whilst California Adventure (18 days from £4,665 pp*) and Peru & Galapagos (22 days from £11,250 pp*) are sure to tempt travellers wishing to venture further afield. 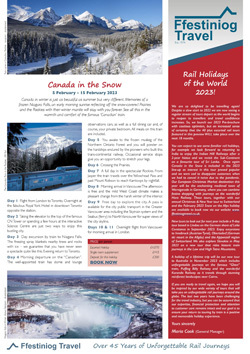 Ffestiniog Travel can also arrange tailor-made itineraries for Special Interest Groups - such as geology and music groups, gardening clubs, and history and art societies – recent examples of which include a music tour to Venice, geology field trips to the USA, Europe and the UK, and an Isle of Man Holiday for members of the University of the Third Age. *Depending on the itinerary chosen, prices include rail travel and transfers, flights, accommodation on a B&B basis, some other meals, excursions and the services of a tour leader throughout. All prices are based on two people sharing – single supplements apply. It has never been so easy to book with Ffestiniog Travel. All escorted tours can now be booked online via the website www.ffestiniogtravel.com at the touch of a button.